A popsicle or Ice pop is a water based frozen snack. It is known by different names in different parts of the country like Canada ( Popsicle), Ireland / US (Freeze pop), UK (Ice lolly), Australia / New Zealand (Icy pole) and so on. Ice pops keep us cool during summer days. For kids, there is nothing that can be compared to the fresh fruit flavored posicles. For me, making attractive and toothsome Popsicles are the easiest way to make my kids happy. 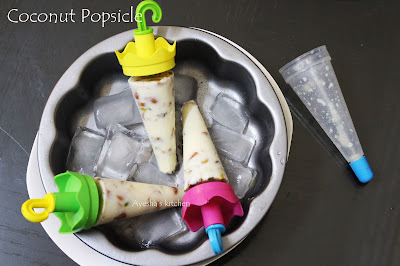 So lets see a simple popsicle recipe which my mom used to prepare for me in my school days. A very yummy nutty popsicle with the fine flavor of grated coconut...enjoy!! Here is the recipe for a simple popcicle / best popsicles ever for summer / popsicle treats /kids summer treat. Boil milk in a vessel and when hot, add the grated coconut, condensed milk, cardamom powder and chopped nuts. Cook it for 5 minutes stirring continuously. When done, remove from flame . Let it cool and then pour it into the popsicle mould. Close it with its stick. When done, unmold it by keeping the mold under the tap water and then slowly remove it. Enjoy!!! !